Below, you will find 7 healthy and cost-conscious, budget-friendly recipes, plus a shopping list for all of the ingredients. 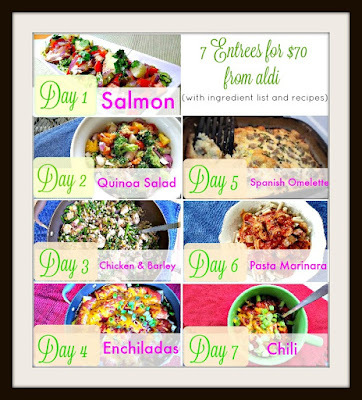 All 7 recipes are below and included in this post. We are all about healthy cooking here. Don't get me wrong, we enjoy our treats as well. But if I can tweak something here and tweak something there to use better ingredients and healthier choices for our main entrees, I do. We also have a need to be very cost-conscious when it comes to cooking. 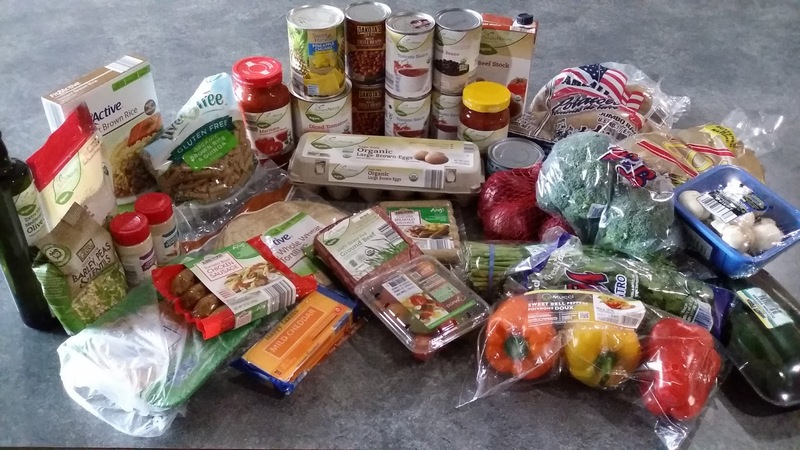 There has to be a balance between trying to be healthy and trying to save money. Cooking healthy doesn't have to be ultra-expensive, though. 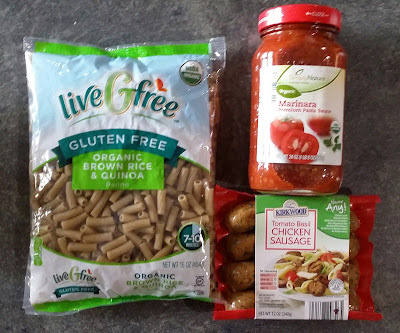 For this entree meal plan, I tried to buy the organic or more natural version of the ingredients if they were available. Some of the ingredients are fresh vegetables, so prices will of course vary from week to week. But one week broccoli might be on sale, and the next week asparagus might be on sale, etc. It should all balance itself and stay around $70. Note: There was a sign in our aldi the last time we shopped saying something about certain vegetables being unavailable until the end of April because of weather conditions in the growing regions, so broccoli might not be available soon. This entree meal plan has a little bit of everything. There are a couple vegetarian nights, there's a fish night, a chicken night and a beef night. 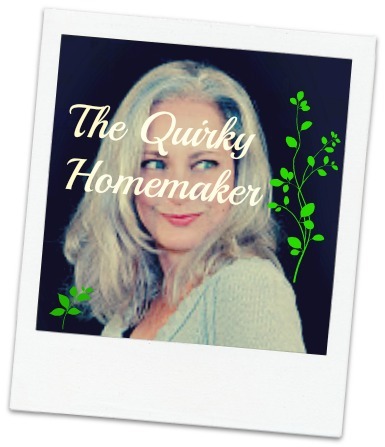 I will give you the exact ingredients and recipes OR links to recipes. You can right click the picture below & save to your computer to print out the list. 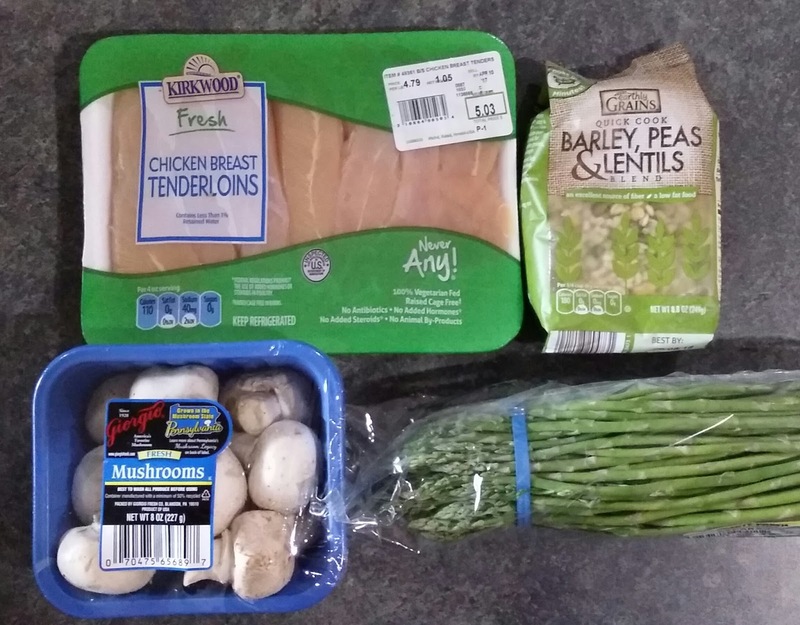 Note: Only half of the mushrooms are used in the Skillet Chicken & Barley, so if you would like to add more veggies to the Spanish Omelette, you could slice the other half of the mushrooms and add it to the egg dish. There will also be a couple red onions left. 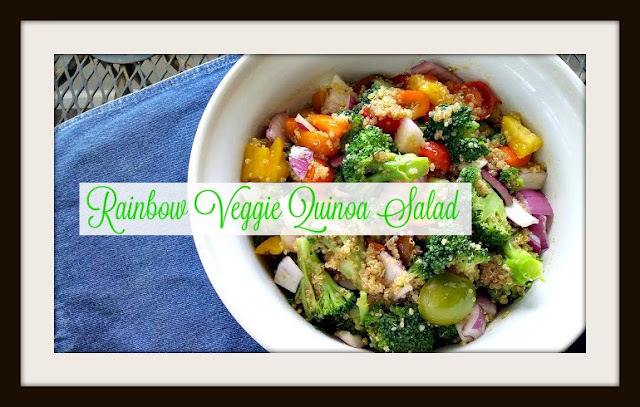 You could add one of the colored peppers if you decide to only use one pepper in the Rainbow Veggie Quinoa. That way your Spanish Omelette would have potatoes, mushrooms, peppers, onions & sausage. Preheat oven to 500℉. 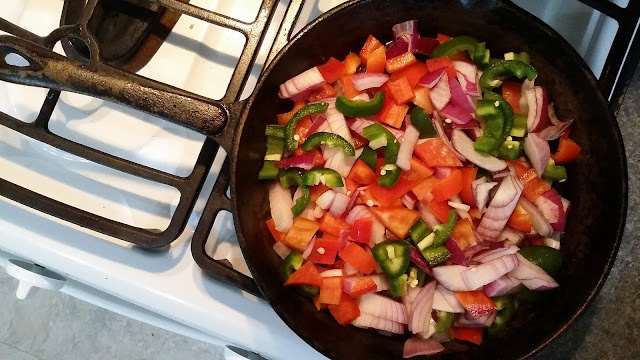 Sautee peppers and onions in olive oil over medium heat in a cast iron skillet for about 10 minutes, until onions are translucent and all veggies are soft. Pour pineapple juice over veggies. Mix together the salt, pepper, paprika and cumin in a bowl. 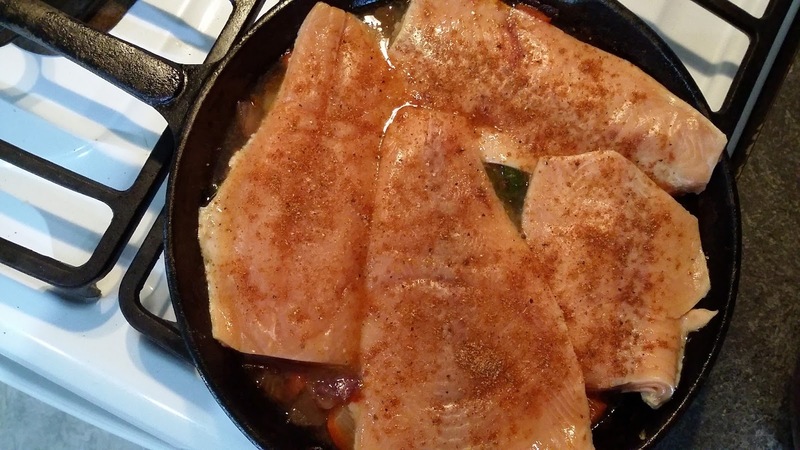 Place salmon fillets on top of vegetables and sprinkle with seasoning mixture. Place cast iron skillet in oven. Cook for 10 minutes. 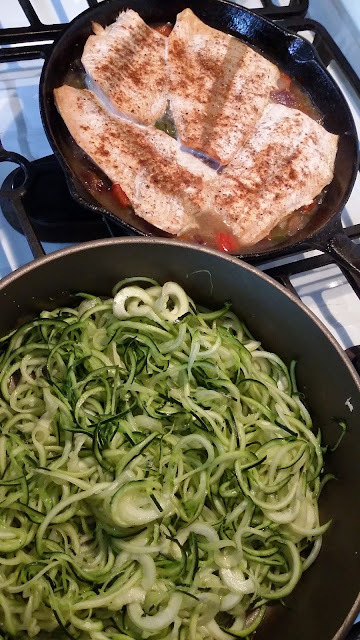 While Salmon is cooking sautee spiralized zucchini in medium skillet for 3 - 5 minutes, until soft, but not overcooked. Add pressed garlic, salt and pepper to zucchini and stir. Stir pineapple and cilantro together in a bowl. 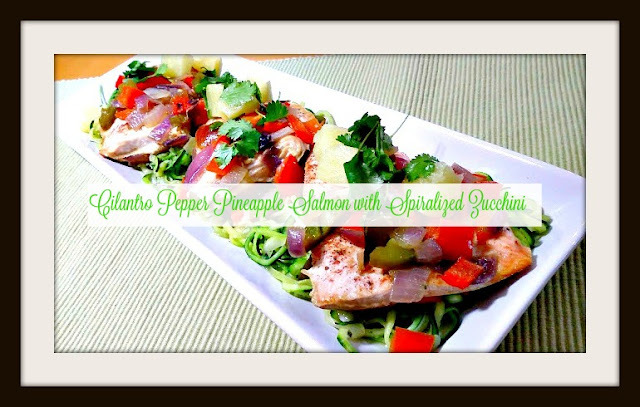 Place zucchini on plates or platter and top with the salmon. Spoon onions and peppers over salmon. 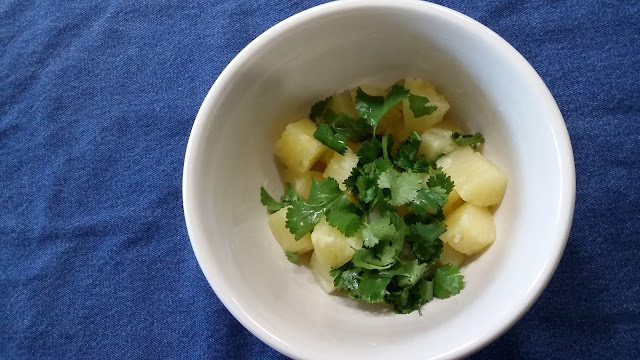 Then, spoon on the pineapple chunks and cilantro. 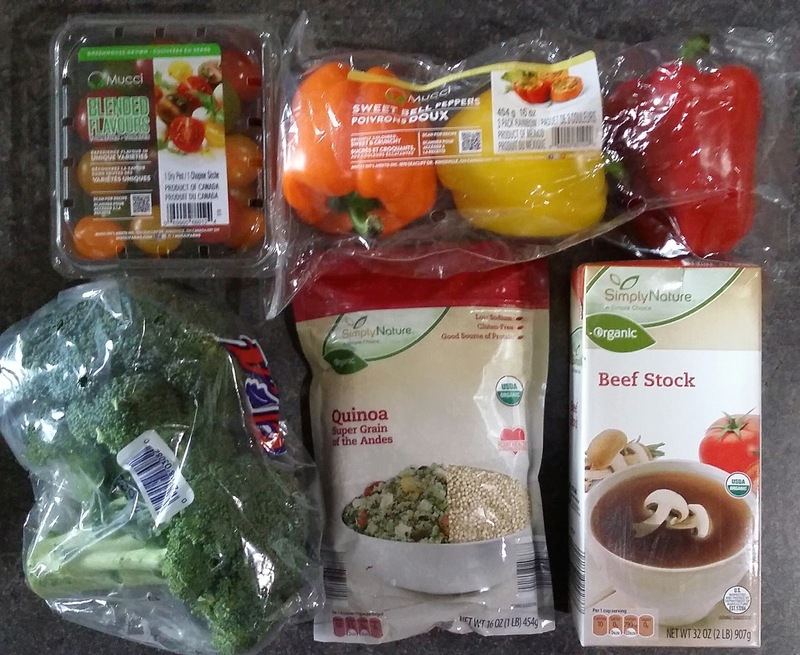 Combine beef broth and quinoa in small saucepan. Bring to boil. 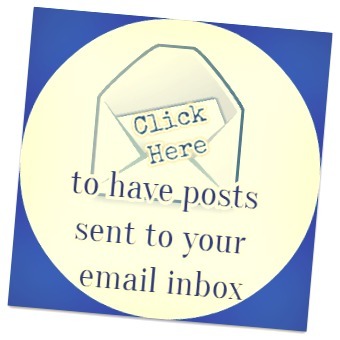 Turn down to low and cover with tight fitting lid. Cook for 15 minutes. Turn burner off and let sit for 3 - 5 minutes. Take lid off after 5 minutes and fluff with fork. Let cool. Bring 6 cups of water to boil in a large pot. Add the broccoli florets and cook for 3 minutes. Remove broccoli to a bowl with ice water with a slotted spoon. 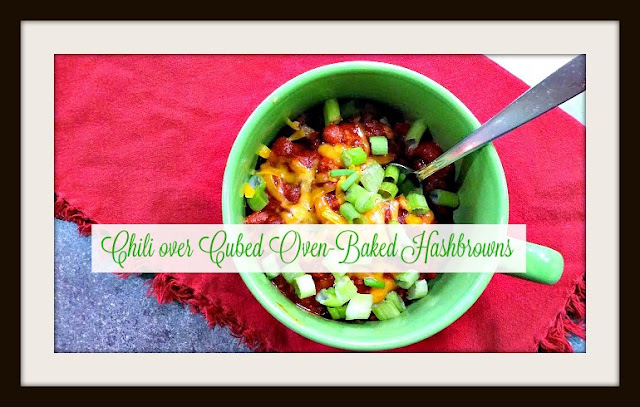 Combine all of the chopped and diced veggies in a bowl. Add the blanched broccoli. Make your dressing by whisking together the oil and seasonings. Pour dressing over quinoa and veggies. Stir to combine. 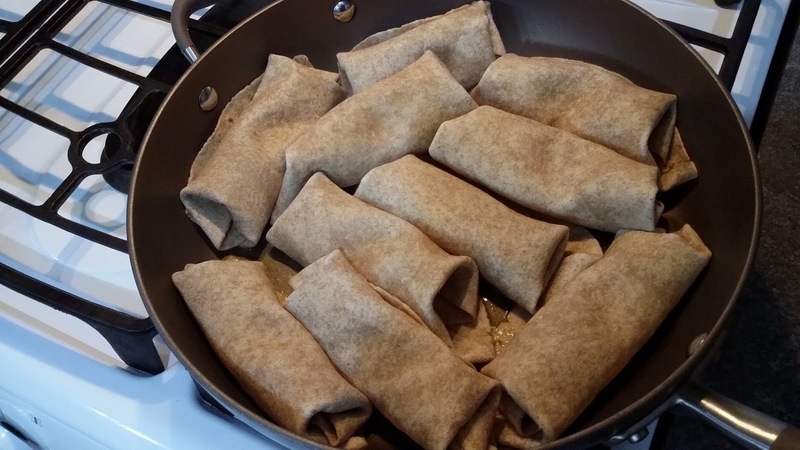 Cover and place in fridge for at least one hour. I used the leftover beef broth in this recipe. I know it might seem weird to combine beef broth with chicken in a dish, but sometimes I do it if I have leftover broth. It's all good. Trust me. 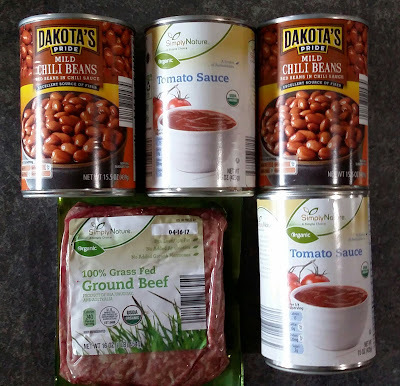 Cook Barley, Peas & Lentils according to package directions in beef broth and water in a medium saucepan. While the barley is cooking, heat olive oil over medium heat in large skillet. Add onion and chicken to the skillet and sprinkle with salt and pepper. Cook until onions are translucent and chicken is no longer pink ~~about 10 minutes. 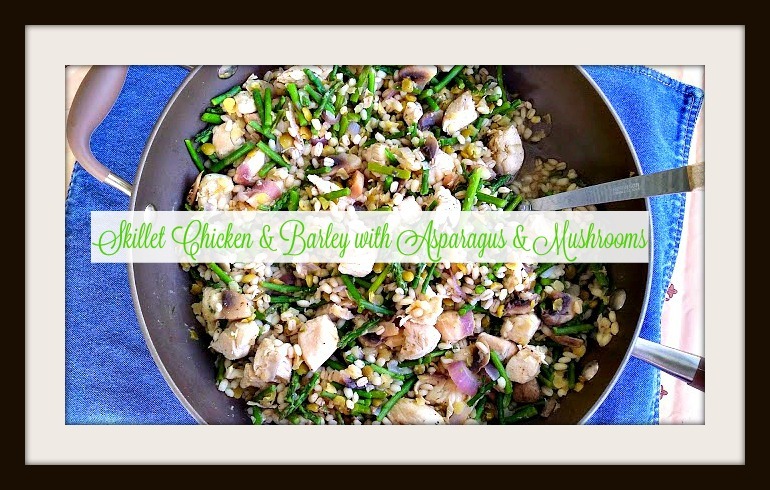 Add the mushrooms and asparagus and cook for 5 minutes longer or until asparagus and mushrooms are tender. When barley is done, drain extra liquid and add barley to chicken and vegetables in skillet. Add the pressed garlic and stir. Cook for 5 minutes over medium low heat. Bring water to boil in small saucepan and add 1 cup of quick cook brown rice. Turn to low, cover with lid and cook for 5 minutes. Turn burner off and let sit for 5 minutes. Fluff with fork. 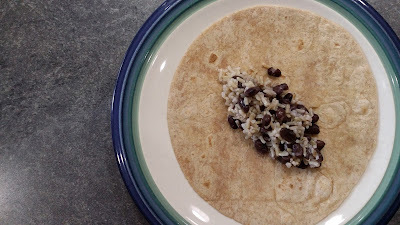 Add the drained and rinsed black beans to the brown rice and stir to combine. Whisk together the tomato sauce, water and spices. 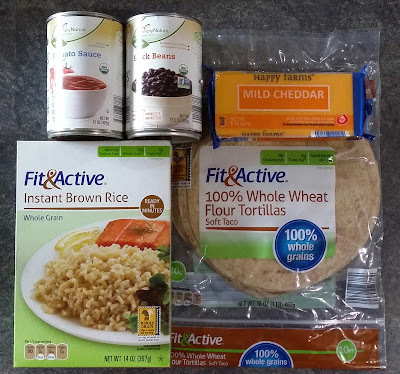 Put 2 heaping spoonfuls of rice and beans in the center of each tortilla. Fold the ends over on ends and then roll. Pour sauce over enchiladas making sure that each one gets sauce over it. Cover with lid and cook over medium/low heat for 10 minutes. Add shredded cheese and cook for 5 minutes more. Turn burner off and let sit for 5 minutes. We garnished ours with green onions which we already had in the house. If you want to buy green onion, that will add around .99¢ to your total. We used our Spanish Omelet recipe to make this oven-baked casserole. 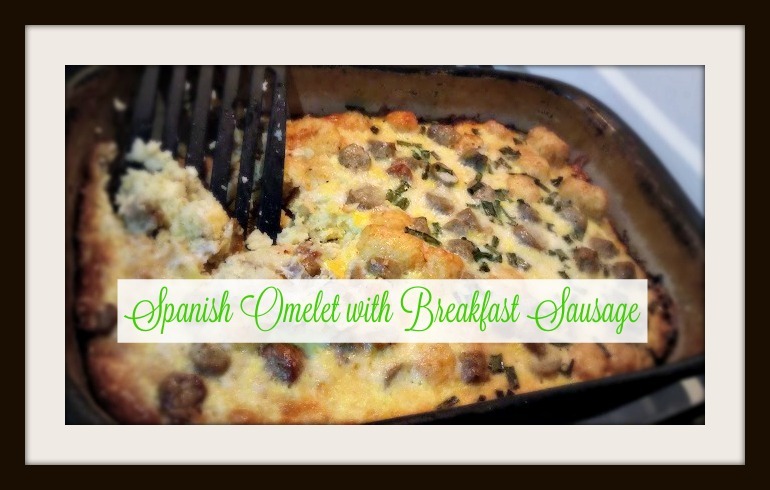 We doubled this recipe and added the breakfast sausage, which we cut into bite-sized pieces. Since the sausage is already pre-cooked, we just cut it and then added it to our egg and potato mixture before we poured it into the casserole dish. When I double the recipe, I use my 9x14 baker instead of the cast iron skillet when baking it. I place the 9x14 baker into the oven while the oven is pre-heating and then pour a little olive oil into it to coat the bottom and sides before pouring the egg/potato/sausage mixture into it. Bake at 350 for 40 - 45 minutes until the eggs are set and a toothpick or cake tester comes out clean. (The original Spanish Omelet is only 6 eggs and is cooked in a cast iron skillet, so it originally only takes around 30 minutes. When you double the recipe, it takes longer to cook. All ovens vary, so check after 35 minutes just in case) The casserole can be served warm, or can be pre-cooked and eaten out of the fridge. This one is the most straightforward recipe on here. Cook the noodles according to package directions. We cooked ours on the low-end of the recommended time because we like our noodles a little chewy. Everyone liked these brown rice & quinoa noodles, so don't be afraid to try them! Cut the sausage into bite sized pieces and put them in a medium saucepan with the Marinara sauce. Warm the sauce until it's just bubbly and turn to low. 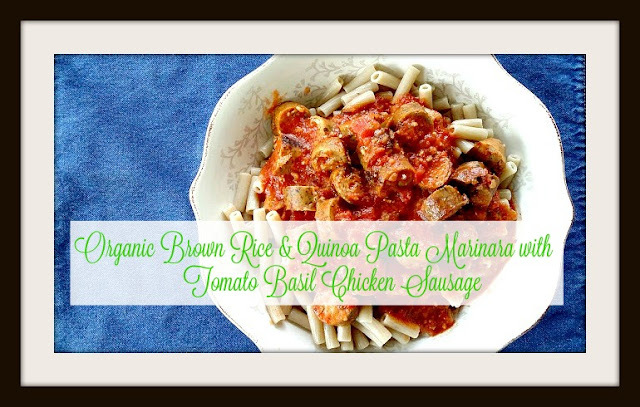 Put drained noodles into a serving bowl and ladle Sausage Marinara sauce over the noodles. Add all other ingredients except cheese and heat until boiling, while stirring. Turn to low and let simmer for 30 minutes, stirring occasionally. 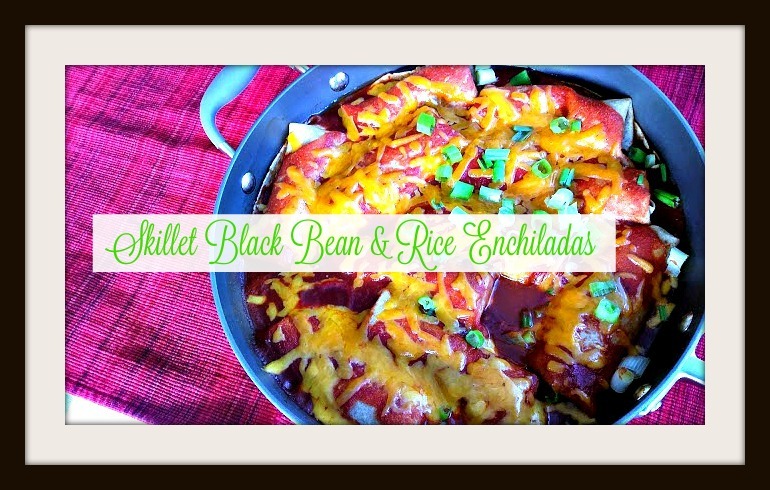 Garnish with cheese and/or green onions. We served ours with cubed oven-baked hashbrown potatoes made with the leftover yellow potatoes. It was my intent to make potato wedges with the baking potatoes, but it looked like the yellow potatoes needed to be used first. This is the first installment in a series that I might try to do creating meal plans with ingredient lists and recipes using food from aldi. 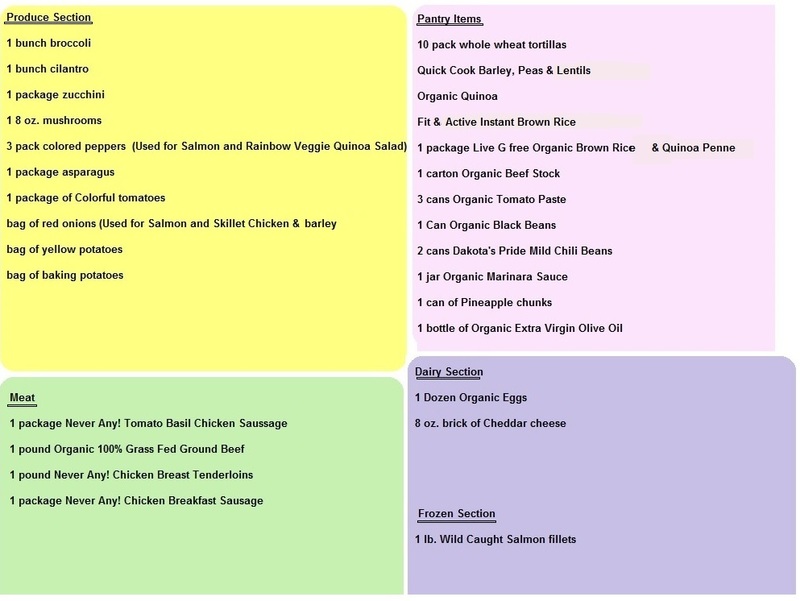 Let me know if this was helpful and I'll work on creating some more complete 7 night meal plans. 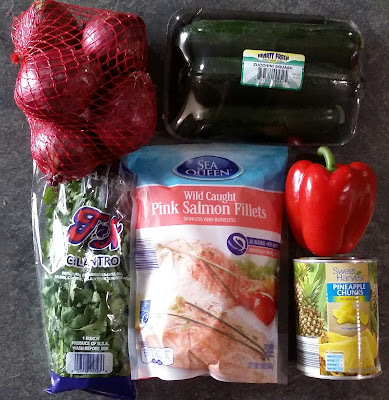 Do you try to use healthier ingredients when you cook? Do you have tried and true recipes that you use on your weekly meal plan or do you like to switch it up?